Dragon Age 2 is not the consolefied catastrophe a vocal minority on the Internet would have you believe. Most of the changes that have become a lightning rod for fanboy scorn are so minor that within a couple hours of playing the game you’ll forget that anyone ever cared. 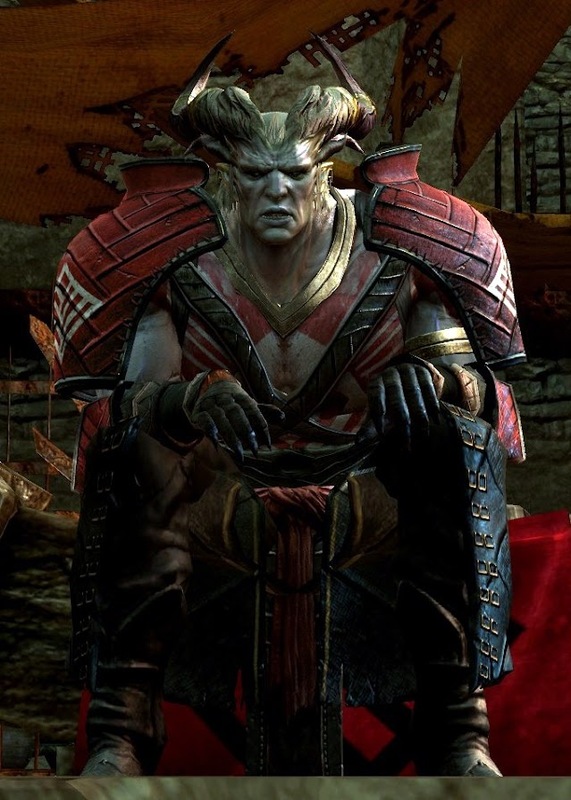 Dragon Age 2’s problems run far deeper than a user interface devoid of garishly bit-mapped accoutrement or a new design for a character who has been established as a shape-shifter, or even an ugly opening environment that does not put the game’s best visual foot forward. These complaints only serve to distract from a heartbreaking number of fundamental missteps in the game’s design. 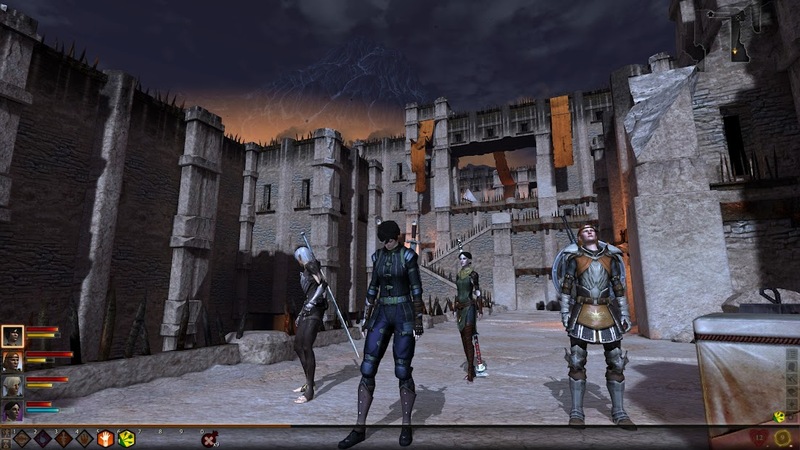 If you’ve played the demo you know the game begins as your main character, Hawke, is with his or her family fleeing the Blight in Ostagar, an event originally depicted in Origins. Actually, I take that back. The game, of course, begins with its now famous “framed narrative”. A smarmy, beardless Dwarf named Varric is being interrogated by a “Seeker” from the Chantry sent to investigate the Champion of Kirkwall. The gameplay occurs during a series of flashbacks as Varric relates Hawke’s tale. The framing device gives Bioware license to play with the idea of an unreliable narrator, but the end result is only two fantasy sequences in which the player is more powerful than they’re supposed to be. Otherwise it’s mostly an excuse to jump the narrative forward years at a time. After escaping the Blight in Ferelden, one such voice over and convenient montage delivers you to the ancient city of Kirkwall. As a destitute refugee, the only way to gain entry to the city for yourself, your mother and your sibling is to agree to one year of indentured servitude as either a smuggler or a mercenary. That sounds like an exciting adventure, right? But you don’t get to play that part. The next thing you know it’s a year later, your service is over and you’ve got a home in the poor side of town. At this point you meet Varric for the first time and he offers you the chance to improve your fortunes by joining an expedition into the Deep Roads, an ancient underground complex of roads and cities built by the dwarves in antiquity. Normally the Deep Roads are overrun with darkspawn, but the recent defeat of the Archdemon in Ferelden (another reference to the events of Dragon Age: Origins) means the Deep Roads are as safe as they’ll ever be. A palace or castle or somesuch. Unfortunately, to secure you position in the expedition you first need to cough up 50 gold sovereigns to become a full partner. Thus begins about 10 tedious hours of doing favors and FedEx quests for a few silver at a time. You’ll of course have the chance to meet new party members, take on their personal tasks and ingratiate yourself with certain city factions. Technically there are also a number of “main plot” quests during the first act, but it’s easy to mistake them for yet another side-quest. You can always go into your quest journal to read up on your accepted quests, but it’s so easy to simply chase quest markers on your mini-map that at one point I couldn’t figure out how to progress into the Deep Roads even after paying my share. I spent a while jumping between locations hoping it was some kind of scripting bug before I realized one of the quests I had written off as beneath my interest was an unskippable plot mission. That I could make such a mistake even after playing for 13 hours is a testament to how ill-defined the game’s central plot is. There are tensions between the Mage’s Circle and the Templars and later between a group of shipwrecked Qunari and the locals, but those are features of the setting as much as anything. Aiming for a more intimate tale about one person raising their family to prominence in a foreign city is not a bad goal, but in all honesty, it demands writing of a caliber Bioware can’t match. There is no thematic through-line. There are no dramatic foils or interesting rivals to best. You spend the whole game doing favors you’d rather not for people you don’t particularly like in a world that is distractingly static despite the elapsed time until the game ultimately funnels you into a forced binary decision where both sides are unambiguously wrong. On the other hand, the combat is more exciting than ever. It’s faster than in Origins, and it’s true the PC version has lost the fully pulled out isometric view, but the tactical situations where that was most useful are largely missing from Dragon Age 2. Positioning and choke-points were a huge part of managing enemy encounters in Origins. The sequel substitutes a more intense need to manage threat and wrangle waves of reinforcements that will attack your ranged characters if you leave them on an island. The biggest problem is a lack of variety in enemy types and combat encounter design. There is really only one battle in the entire game that breaks from the standard high-HP boss supported multiple waves of low and mid-level mobs. But the skill trees are still complex and offer many different and effective paths. Spectacular spell combos from the first game have been replaced by cross-class combos. Certain abilities can stagger, stun or make enemies brittle. Other characters can exploit vulnerabilities with attacks that receive huge damage bonuses. Taking full advantage of this aspect requires actively jumping between characters which adds a level of complexity above queuing up two spells on a single mage as you could in Origins. Far from being limited by the needs of console players, the more appropriate comparison is to MMOs with abilities on cool downs and a tank/dps/healer dynamic. The changes made to the dialog system are also largely beneficial. The switch to a fully voiced player character is a big improvement over the inexplicably silent protagonist you played in Origins. No longer does the camera cut to your character staring dumbly at everyone else during cut scenes. Dialog choices are made through a Mass Effect-style wheel with the added twist of simple icons to indicate the intended tone of each simplified selection. You won’t know exactly what you’ll say, but a laurel leaf indicated a diplomatic tone, while a red fist is aggressive. Most of these icons are self explanatory, but the game does not go out of its way to tell you how to interpret some of the more abstract options. After finishing the game I’m still not sure what the purple gem signifies. 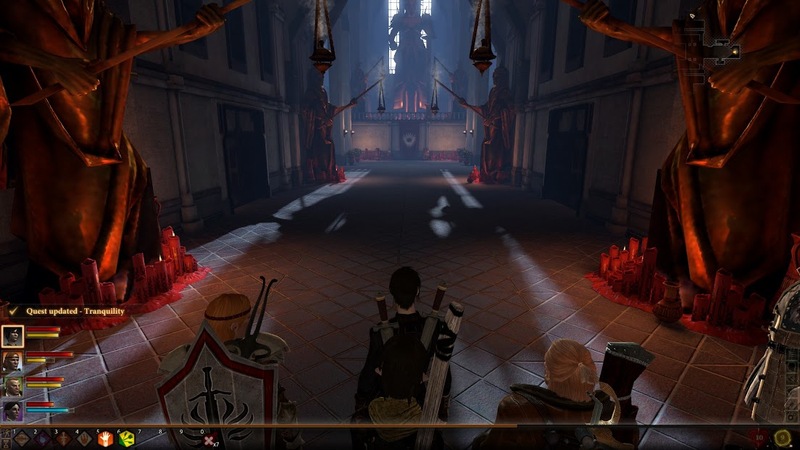 Dragon Age 2 also looks quite a bit better than the first. Character models are universally improved, outdoor environments look far more natural and the art and architecture found in Kirkwall, hearkening back to its history as a center of the slave trade, are quite striking. Unfortunately, female characters, while they’ve lost the weirdly large man-hands present in Origins, instead are saddled with creepy-looking looking fingers that wouldn’t look out of place on the Crypt Keeper. Weapons also still magically levitate on everyone’s back, but the combat animations and spell effects all look great, and performance is quite good even with the high resolution texture pack on my aging Radeon 4850 at 1080p. A more serious problem is the endemic use of recycled dungeons for various quests. It’s quite clear that most of the environments you visit have a single dungeon design slightly modified with different entrance and exit points, certain paths and door blocked off, but still visible on the mini-map. After about 15 hours you have almost literally scene every place the game has to offer. Every subsequent location or set-piece is just a new iteration of a place you’ve already been. It’s inexcusable in a game of this stature from a studio like Bioware. There have been reports that Dragon Age 2 was on a very short development cycle, but it’s hard to understand the urgency to launch a Dragon Age sequel less than two years after the first game, especially when the studio has both Mass Effect 3 and Star Wars: The Old Republic scheduled to come out in 2011. I’m tempted to say Dragon Age 2 could have benefited greatly from an additional year of refinement and content creation, but that may not be the case. Everything about the game’s structure and design seems built around a short turn around. Another year wouldn’t necessarily make the narrative framing device more appropriate and, if anything, DA2 just isn’t ambitious enough to be satisfying to begin with. The game spends hours and hours making promises it can’t live up to. It isn’t epic, if that’s your thing, nor is it rich or lively enough to engage on a more intimate level. The sad fact is we live in a post Assassin’s Creed world and if you want an RPG that takes place in one city huge, densely populated and reactive environments like Venice or Rome as recreated by Ubisoft are the new bar. Sadly, Kirkwall can’t even match the size and activity of Rabanastre from Final Fantasy XII on the PS2. By comparison Dragon Age 2 is hopelessly static. NPCs stand in their appointed places at their appointed times. Standers by don’t react at all when a huge fight breaks out in front of their assigned corner. It’s utterly lifeless, boring and quickly feels claustrophobic. That’s not to say Dragon Age 2 is a bad game, exactly, but it’s not good either. It can be engaging and there are genuinely engaging characters and quests to uncover, but it hangs together poorly. The overarching structure is ill-conceived, the story largely uninteresting and it shares a problem with Mass Effect 2 in that both suffer for being written explicitly as the second part of a trilogy. It is difficult to shake the feeling that Bioware seems content these days to prototype gameplay changes in a part two while holding back all their most interesting content for a planned part three. In Mass Effect 2 that made for two-thirds of a good game, one in dire need of a third act. That ratio is even worse in Dragon Age 2 which resembles nothing more than a game designed kill time between Origins and whatever comes next.